Ajaxian talks about an interesting way to use Google Gears for sites that don't necessarily integrate with Google's toolkit for offline applications: inject code using Greasemonkey. An article shows how you can save a number of Wikipedia articles for offline use, without depending on your browser's cache. Sites with a lot of static information -- Wikipedia, any API documentation, web-based email -- would be great to be able to use when no internet connection is available. But what if you're a user that always has an internet connection? Then adding Gears to a site doesn't do much, right? Wrong. Imagine your favorite website is now stored on your computer, and it syncs whenever there's altered content. Whenever you look at the site, your browser is grabbing everything straight from your hard drive. Did you just make a search for your best friend on Facebook? Don't wait 5 seconds the next time that search runs, have the results immediately! Meanwhile, save the webmasters' precious bandwidth/server power! 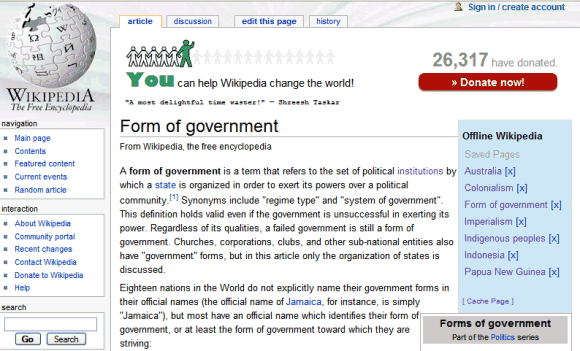 Here's the Greasemonkey script for Wikipedia (requires Firefox + Gresemonkey + Gears). For each Wikipedia article you want to save, click on "cache page" and the script will save the text and the images. It would be nice to make it work with any site. Nice, but howmuch diskspace does it take to have the complete wikipedia local? Nitpicky, but you say "cache article" in your description but the screenshot says "cache page". Also, it's not technically "off-line," but if you just want wikipedia "on the go," get the new amazon e-book reader and you have free wireless access to wikipedia at all times (well, in the US, Canada, and parts of Asia and Australia). Google - Wikislice gives you all pages related to Google. Disclaimer: I work for this project. The article contains instructions on how to make it work for any site. And how do you use the off-line HTML version of Wikipedia? I linked to that article, but it has some Wikipedia-specific code. I didn't download it, but I suppose it's similar to what you see at en.wikipedia.org, without the images, sounds etc. Take a look at the Firefox extention Scrapbook. What is the main difference between Scrapbook and the solution described on this page? You can read the entire WikiPedia offline with WikiTaxi (http://www.yunqa.de/wikitaxi/). WikiTaxi supports all Wikis from MediaWiki like Wikipedia, Wikiquote, Wikinews, in English, German, and other languages. It works really well and fast, too! English: 6.4 GB (fits on a 8 GB USB-stick). German: 1.9 GB (fits on a 2 GB USB-stick). All other Wikis are smaller, so you can easily fit multiple languages on drive, USB-stick, or DVD.